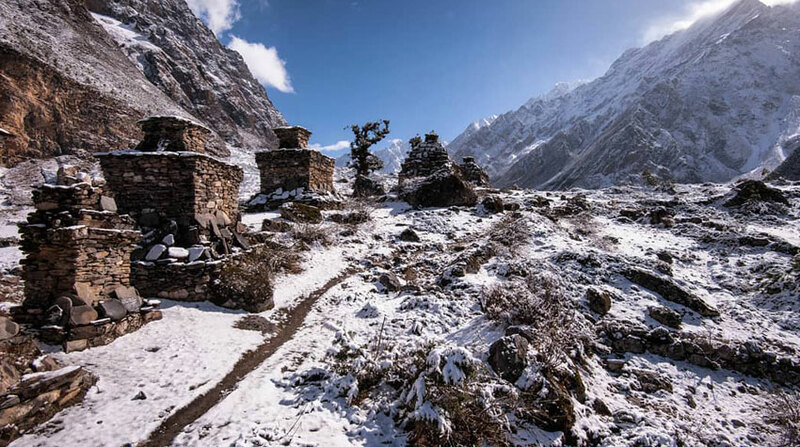 Tsum Valley Trek is the virgin trekking trail for the intrepid trekkers which offer the pristine opportunity to discover the ancient hidden treasure of Nepal. Ringed with the towering white mountains like Himalchuli (7,893 m) and Boudha Himal (6,672 m) to the west, Ganesh Himal (7,429 m) to the south, and Sringi Himal (7,187 m) to the north, Tsum Valley still maintains its unique culture, art and precious tradition among the world. Entering in Tsum region was totally restricted to the tourist for a long time. In 2008 the government of Nepal released such restriction and opened to the group tourists to explore and taste the ancient culture of Tsum Valley. Attached with Tibetan Border, Tsum Valley is situated on the northwest side of Kathmandu Valley in Gorkha District of Nepal. "Tsum" originates from the Tibetan word "Tsombo", which means "vivid". People inhabitant in Tsum Valley is influenced by Tibetan Culture and Tradition. Tsum Valley Trekking route cater you a lifetime opportunity to experience the two different cultures together, Nepalese and Tibetan where the brothers of a family marry a single lady. Tsum Valley journey begins from Sotikhola, seven hours drive from Kathmandu. Enjoying the gorge Budi Gandaki River, hiking through the wonder alpine forest, and small Gurung villages reach Tsum Valley. Observe the village and surrounding lofty White Mountains then, exit the trek from its entrance, Sotikhola. Day 01: Drive Kathmandu to Sotikhola. Max. Altitude: 700 m (Sotikhola). Day 02: Trek to Maccha Khola. Trail Attractions: Budhi Gandaki River, Waterfalls, Rocky Trail, Gurung Village, and Suspension Bridge. Max. Altitude: 900 m (Machha Khola). Day 03: Trek to Jagat. Trail Attractions: Hotspring and Stone Stairs trail. Max. Altitude: 1,410 m (Jagat). Day 04: Trek to Lokpa. Trail Attractions: Green vegetation, views of Ganesh Himal and Shringi Himal. Max. Altitude: 2,240 m (Lokpa). Day 05: Trek to Chumling. Trail Attractions: Waterfall, Pine and Rhododendron Forest, views of Himalchuli and Boudha Himal. Visit Ghumling Gompa. Max. Altitude: 2,386 m (Chumling). Day 06: Trek to Chokangparo. Trail Attractions: Suspension Bridge, views of Himalchuli and Ganesh Himal. Max. Altitude: 3,010 m (Chokangparo). Day 07: Trek to Nile. Trail Attractions: Rachen Gompa, and Hydro Power at Lar. Max. Altitude: 3,361 m (Nile). Day 08: Trek to Mu Gompa. Trail Attractions: Tibetan Landscape, Mu Ghompa, and Dhephu Doma Gompa. Max. Altitude: 3,700 m (Mu Chompa). Day 10: Trek to Burgi. Trail Attractions: Visit Milarepa Cave, views of Poshyop Glacier, Kipu Himal, and Churke Himal. Max. Altitude: 3,245 m (Burgi Village). Day 11: Trek to Chumling. Day 12: Trek to Philim. Max. Altitude: 1,570 m (Philim). Day 13: Trek to Khorlabesi. Max. Altitude: 970 m (Khorlabesi). Day 14: Trek to Sotikhola. Tsum Valley Trek Trip finished here! Kathmandu to Sotikhola by sharing Bus. Twin Bed Sharing Teahouse/Lodge accommodation. Breakfast. Lunch, and Dinner during Trekking. An English speaking trekking guide. One porter for two trekkers. Sotikhola to Kathmandu by sharing Bus. Breakfast, Lunch, and Dinner at Kathmandu. Extra expenses occurred in case of landslides, political unrest, strike etc. Rest of all that are not mentioned in cost includes list. Wants some modification on Tsum Valley Trek itinerary? contact us to customize it.